I suspect all is fine with my kidneys and I'll be going for nothing. My GP is being cautious. We'll see. Because the appointment is so out of the way, I'd really like to cancel it... but I should go. Sil---you can make knitting needles? WOW! That is so cool! Today I took the day off and took my mom to her dental appointment. My sister still isn't feeling up to driving, so I said I'd do it. My sis needs all the rest she can get. Lk, I hope your sister is all right. Today my laptop died. It just freezes and black screens. I'm hoping it responds to all the diagnostics that are being run on it. It is insured but then I would need to go about proving that it's a hardware fault and not a virus. Ladykat wrote: Sil---you can make knitting needles? WOW! That is so cool! Well, not exactly, though in theory I know how. I am just making decorative toppers for the ends like these ones. I've made some cup cake ones today. Silwen, have you ever used lamb mince in cooking? It's delicious and I have a great recipe for it. Also I want to learn how to know just so I can buy some of your toppers. They're very cool. Today I made double chocolate muffins. Unfortunately I should have checked the reviews when measuring the ingredients as the majority if the reviewers said to use more sugar than the recipe stated.nso they did not turn out nearly as sweet as I hoped for. Oh dear, sorry about your laptop, Tari. That's really annoying! I always get very stressed when something is wrong with a computer/laptop. I use lamb mince in some things. Actually, I was just looking up how to make moussaka from scratch. There used to be a spice mix in our supermarket, but it hasn't been available in months, so I will just have to put it together myself. The problem is that there are so many different recipes, I will have to decide which one is most like the original. Today there is nothing at all on TV. You know, I have never tried Moussaka! Had to look it up to see what exactly was in it but it did look quite interesting. Today my doctor gave me strong anti-inflammatory for my joints. I haven't tried them yet as I need to take them at breakfast time because they are slow-releasing. Need to go back next week and get more blood taken to see if there has been any change in my inflammatory markers. We're getting old, aren't we? We seem to only be at the doctor's nowadays! Today I went back to my spinning wheel to get on with some yarn I started in autumn! Because it got so cold, I didn't feel like sitting at the wheel. I've finished spinning up half of it at last so I can carry on with the second half soon and hopefully get it all finished quickly to add to my stash. I got some rainbow-coloured fibre on my birthday and look forward to spinning that next. The doctor is my new best friend at the moment - because I live in such a tight knit community my doctor knows some of my extended family on my mum's side. I'll just call you Rumpelsilwen. Today I have been snapping some shots with my camera. Haven't used it much since I got it at Christmas, but it is a lovely wee thing and I decided that I really should use it more. Today I set up an album on my FB business page with photos of items people can buy directly from me instead of registering with Etsy. That may make things easier for a lot people. There will be more available at some point, but it is mostly jewellery that you can find on my FB page. And now I am getting sleepy. Today, I flew first class for the first time in a long time.. I used points for my flight and sometimes, you can reserve seats in first class. Nice. I am in maryland, now. Oo, lovely, First Class! I am still dreaming of that. Today I got up unexpectedly early so I will have enough time to get work done. Of course I am procrastinating at the moment. I better get started. Today I love my doctor. I was in agony during the night with the cramps in my legs. Took the new anti-inflammatory he prescribed me this morning and I am in hardly any pain at all. Most of the pain in my hands seems to have gone as well. Leg cramps are horrible. I am glad it is better now! 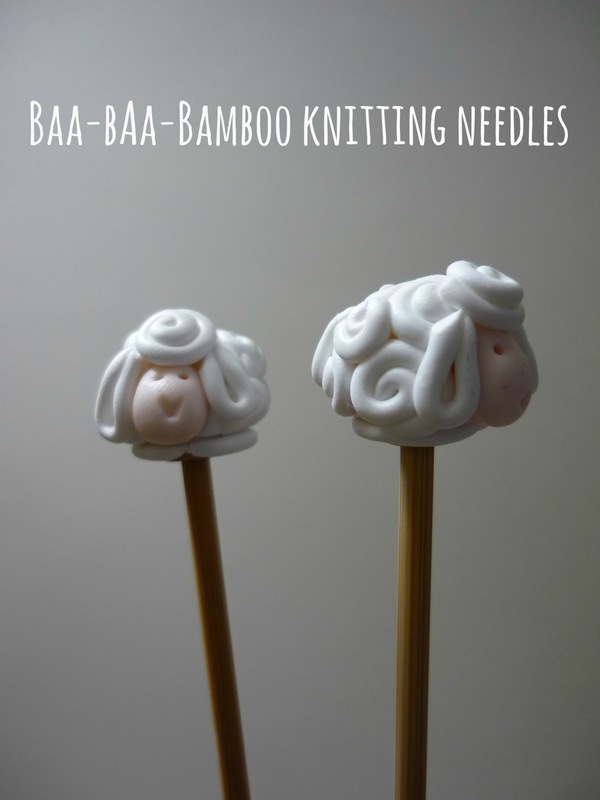 Today I made some more knitting needle toppers. I now have sheep, cupcakes and sushi. Tomorrow I'll make some more, perhaps beehives with little bees on them and some mushrooms. Here's a piccie! The leg cramps is a very new thing. Got no idea what they are, but pretty sure it's all connected to the aches and pins and needles in my hands. Last night was horrendous - it was the first time that the pain woke me up. Today I made tuna pasta for tea. I'm resisting the urge to eat it all by myself. Today I made German potato dumplings with beef patties, peas and gravy. Yum! Needed that. Today I am very tired. I wish it was Friday so I could sleep in tomorrow. I was so hungry that I ate my half and also what Kyle couldn't finish. Today the new meds are making me feel really yucky and queasy. I had a horrible dream last night that I think was loosely connected to the new Star Trek film we saw last night. My university was taken over by bad guys who were killing people. By Benedict Cumberbatch? Could be worse. Today I am procrastinating. Since it is Friday, I may not do much at all, we'll see. Today I was helping my friend with her one week old Siamese kittens. Their mum had to be taken away for an emergency operation and they don't recognise her scent anymore. So they were wailing their heads off and there was frustration all around. In the end it took nearly three hours for them to stop wailing and go to sleep. For one week old kittens they have the lungs of three year olds. EDIT: WE DID IT! WE HAVE REACHED 2000 POSTS! Today, I managed to 'squeeze' in the last post here, since it still states 1999 posts. For the dear old mods. Today I started the new thread here. Come and join!